Planning this trip was daunting. We offer these tips with the hope hope of making your voyage to the Emerald Isle stress free. Make sure to note the preparation notes at the end of this. Aer Lingus flies JFK to Dublin and it was uneventful. The business class folds flat so you can easily fall asleep. The standard seating is comfortable too. I would pull out all of the stops to get sleep on the flight so you can arrive rested and ready to enjoy. We had Mr. Tom Young pick is up from the airport and head for Killarney in the South. He met us with a smile and I knew we were in good hands. Tom loves his country and knows it top to bottom. As he drives you in a vehicle that will accommodate your crew (has everything from compacts and luxury sedans to passenger vans) he will give you history insight, current politics, architecture details… whatever. He stayed with us start to finish for the trip and for first timers it was quite helpful to have the continuity. He customized each day based on weather, moods, availability of sites, etc. It was convenient to be able to leave things in the “boot” of the car. He is also an official Leprechaun catcher! Depending on your time frame he will also stop at destinations of interest and knows his way around them all or will gladly let you explore on your own while he keeps the car warm and tidied up after muddy boots. We departed Dublin immediately and made for a jam packed day in the car. First stop Cork, the second largest city in Ireland with winding cobblestone streets, historical buildings, neat window displays, a lovely river promenade on the river Lee. Touring the Church of Christ the King and St. Anne’s of Shandon were impressive. Next stop Rock of Cashel where St. Patrick christened the Kings of Munster in 450 ad. Then on to Blarney Castle. The walk to the top on narrow winding stairs rewards you with a chance to kiss the Blarney Stone. Careful who you send up because it gives you the gift of gab! Could be true because this is by FAR my longest post yet. Ha.We toured the breathtaking grounds there- Poison Gardens, Witches Kitchens, Druid caves, walking trails, playground, castle tours guided or on your own. Could have easily made a day of seeing the all of that and surrounding town and picked up some of the tweed they make but we were on the move! Tom took a quick detour to Kinsalr (the gourmet capital of Ireland) to a memorial for the 343 Firefighters who gave their lives during 9-11. 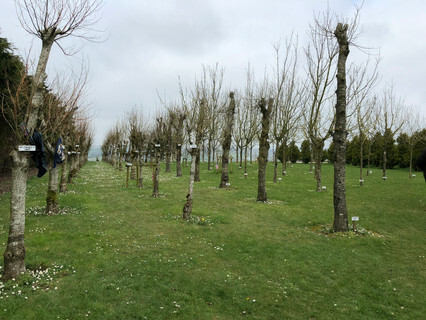 A local woman Nurse Catherine Murphy who worked in hospitals in NY was so moved by them she created this beautiful memorial with a tree for each person with the names attached. Special little sitting place to take it all in. So touching to see this tragedy treated so tenderly in a land so far away. 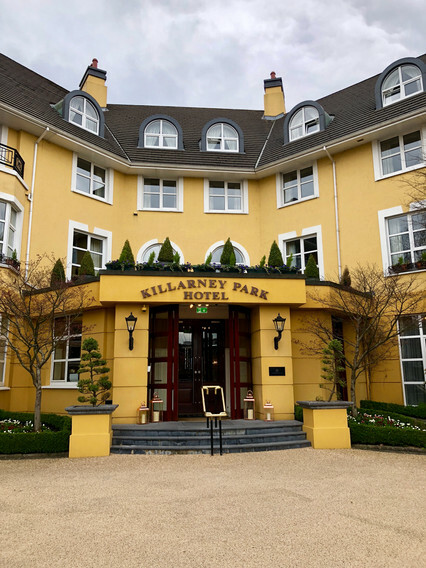 The Killarney Park Hotel is a 5 star hotel right in town. Being able to walk to the huge national park and to the charming downtown was ideal. The staff is just lovey. Mr. Padraig Casey “PC” who seemed to be in charge may be the most hospitable professional I have ever encountered. We had a situation that would have been meh/ok, but he took that and make it into an opportunity to make it a wow. Being an old hotel professional myself I was quite impressed. They offer a nice spa, indoor pool, as well as in and outdoor hot tubs. Breakfast is served downstairs, quick grab and go buffet if you’re hurrying out or take your time and enjoy a full Irish breakfast(trying the traditional black and white pudding is a must). There is a nice restaurant serving lunch and dinner with a lively bar scene in the evenings. Summer time they open the back patio- great place to let the kids run. 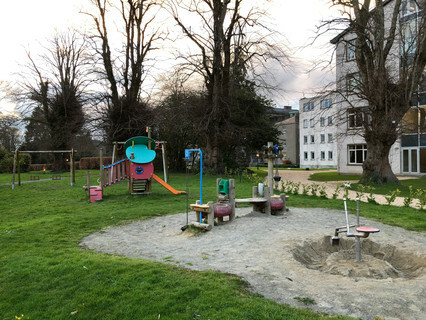 There is also a playground just up to the left. The standard room is, well, standard. Small, tight bathroom without much counter space. But, certainly comfortable and quiet. The Innisfallen Suite is a whole different story. Charming spacious corner room with foyer, sitting room with fireplace, bedroom, dressing room and two bathrooms. Kids loved having the sitting room to themselves. This room has been upgraded in a manner that the standard rooms will be soon. It’s worth noting all rooms have nice hairdryers so you don’t need to bring that or a converter for it. Also USB port next to the bed so no converter needed there either. Score! Another hotel option not in town but does provide car service in and out of town is the Aghadoe Heights. We think the views would be worth the drive (it is walkable but a long walk). 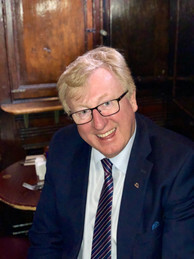 Brendan Harnett is the head concierge and it would be his pleasure to help plan your perfect visit while at the hotel. Modern building so you will have to get your historical charm fix in town. They have adjoining rooms or a two + room suite so fitting the family is no problem. The restaurant and spa will not disappoint. The staff (especially Brendan H) will make you right at home. Make time to walk across to the park. The views are lovely. There are also lovely Bed and Breakfast and AirB&b type accommodations. Read lots of reviews and find the perfect one for you. If you do get one with a kitchen rest easy knowing the grocery is large and has all kinds of fresh goodness. The town Killarney itself is a charmer with rich history and a great food scene. We also experienced “pub culture” which Tom had explained. Pubs are a meeting place. You go in and the bar tender talks to you. Not watching TV or checking the phone but actual human conversation. It’s delightful. You feel as if you’re in someone’s home. Enjoy a walk or horse and carriage tour through Killarney Park. Tour the restored Ross Castle for a peek at 15th century life. How about this street performer – can you almost hear the traditional Irish music? 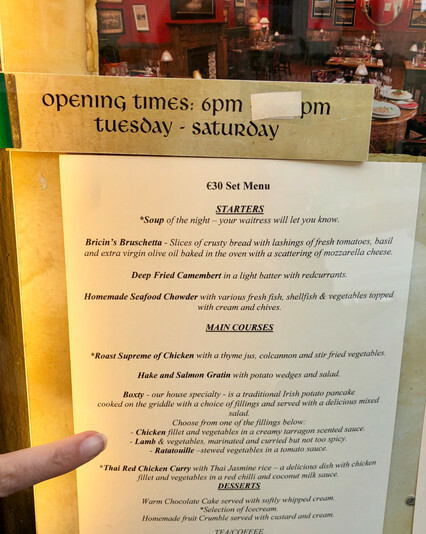 The Irish get mighty creative with their potatoes and the Boxty (below) is not to be passed over when dining at the Bricin on High Street. Yum yum. Lord Kenmare’s is another delightful place for your evening meal in Killarney. A lovey day (or longer) trip from Killarney is to do the Dingle Circle. The Ring of Kerry is another option. Breathtaking views the entire time. Both are part of the Wild Atlantic Way- it’s a scenic drive that goes 2500 kilometers along the Webster coastline. There is an app called WildAtlanticWay you can download to help plan and enjoy your journey. 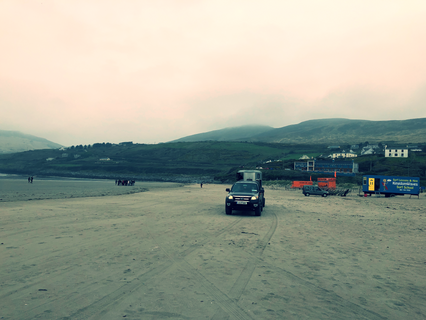 If doing ring of Dingle… First stop to Inch Strand Beach. Great spot to ride horses, surf (too cold for these Florida kids but help yourself) and just run around. There is a little shop and restaurant or enjoy a picnic on the beach. Next to meet Aiden at his charming sheep farm between Ventry and the home the famous GAA player Paidie O’Se. You can’t miss Aidan I fell in love and didn’t want to leave. 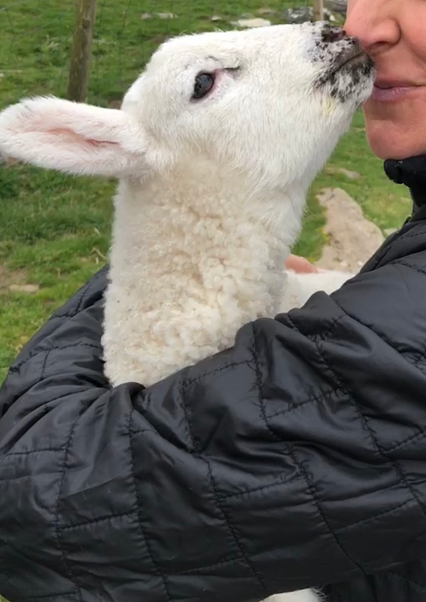 Who knew baby sheep are so snuggly? He also rents out of the homes on his property through AirBNB and if you choose you are welcome to help with the sheep. Next we dropped in at Kilmalkedar Church on the Dingle peninsula where we got to renew our vows(well sort of, old Tom Young and his foolery)! 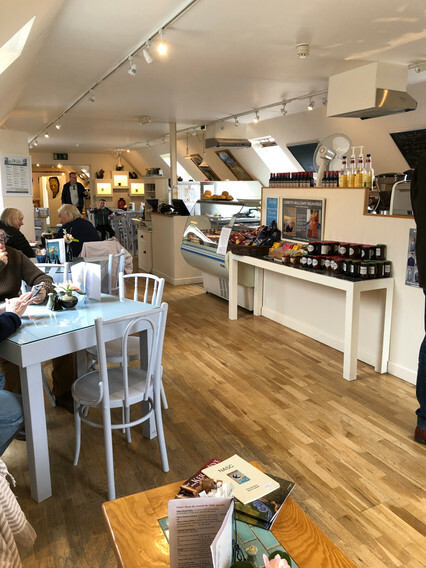 A must stop spot is Louis Mulcahy Pottery studio and cafe. The pottery is stunning and would make a nice gift or souvenir. We snapped up a piggy banks for the kids and an olive oil set. The cafe up top was surprisingly delightful. Then Dingle itself. Doesn’t saying Dingle make you smile? So will being there. Seaside walking town. Delightful restaurants. Murphy’s Pub was great for a pint and lunch. Great wharf-side playground. Kids loved meeting Fungie the friendly wild dolphin and Dingle OceanWorld. Could see spending a week or more here for a family holiday as many do in the summer months. Grocery store, cheese shop and bakery were excellent. Lots of charming Bed and Breakfasts right in town. As you keep on Wild Atlantic Way Cliffs of Moher is a must. Just breathtaking, photos will never do any justice. Photo below but you really just must be there in the moment yourself. Wear walking shoes and take time to see the whole of it. Nice little cafe, shops, and indoor hands on learning indoor area. 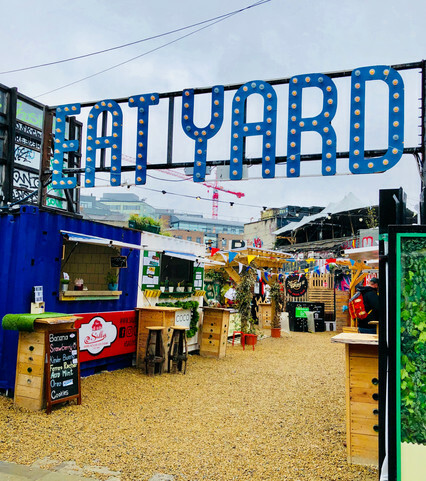 Depending how much time you have in Dublin check out the below attractions and prioritize. If you want to see the jail or do the Guinness tour or any other major attractions BUY YOUR TICKETS AHEAD OF TIME so you aren’t disappointed when they are sold out. There is fabulous shopping and dining to be enjoyed too. The Jail – Kilmainham Gaol 1796 was as heart wrenching as it was fascinating. Christ Church Cathedral is awe inspiring. Must go down to see the underground crypt which is the oldest surviving structure in Dublin. They are known for the angelic voices in the choir so check the schedule and see if you can fit that in. You will be glad you did. St. Patricks Cathedral was beautiful, we did a self guided tour and they actually have quite few hands on activities for little hands like brass rubbing, stained glass jigsaws and more. Dublin Castle was ok. It felt a little like touring The White House. Lots of important historic events took place here, but compared to the other sites its quite modern and nothing hands on. Kids were not into it. The Dublin Zoo is impressive. Nothing to do with Irish History really, but wow what a great zoo. The Elephants, sea lions, gorillas oh my! 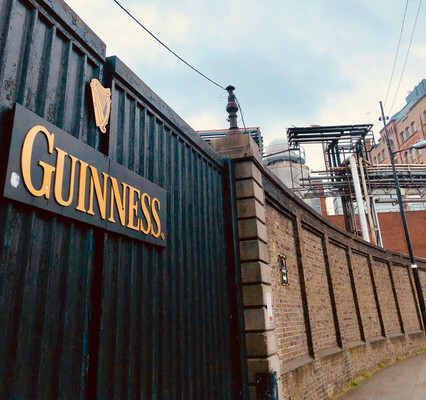 The Guinness Factory Tour is impressive as the history of this meaty beverage is so tied to the modern history of the city. Tour ends at the Gravity Bar with 360* views of the whole area. Children under 13 are free. National Art Museum just reopened after being renovated and is fascinating, especially great for a rainy day. Admission is free and kids really loved the “art backpacks” and audio tour. The National Leprechaun Museum is good fun for the wee ones! 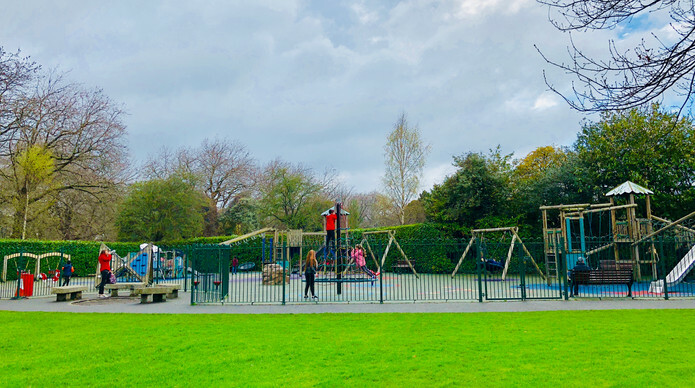 St. Stephens Green the biggest park in town has a nice playground, and the best bird chasing fun! Bring your picnic basket, blanket and stay a while! Jury’s Inn family friendly affordable and in a central location in the city. The Westbury Hotel is a hip busy spot in a confident location for exploring. The rooms are comfortable but nothing to drop your jaw. Adjoining roomsThere is a casual restaurant in the hotel perfect for families. Shelbourne Hotel is a posh option right on the park. Airbnb has great options too – being right in the city center will make it easier to enjoy the rich history. Some really neat older historic ones too. Dublin Dining: as with any city try to book in advance and try openTable for searching for what you want and bookings. is a must. Call ahead and reserve the “snug” for a lunch. 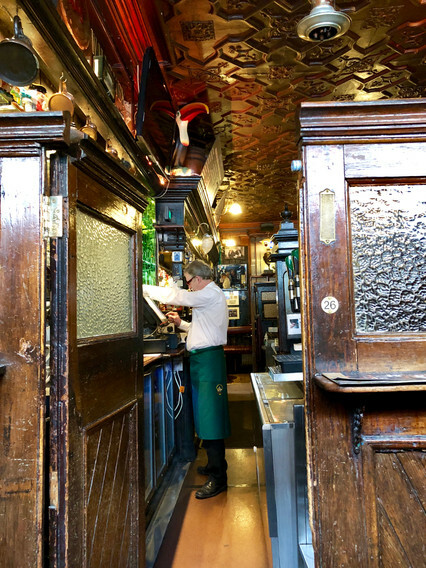 Family friendly restored Victoria pub since 1867. The snug is a private room generally at the entrance that was at one time where the ladies took their drink privately out of sight. Also used for private meetings to negotiate things like marriage dowry, its easy to imagine the likes of Yeats or Shaw musing here. The House of Parliament is nearby so its a common place for government officials to meet off the record. You can just feel all of that happened here. The friendly bartenders are happy to share more. Oh, and the food is amazing! Pearl Brasserie – Chef and owner Frenchman Sebastian was in the kitchen the night we enjoyed this charming and innovative culinary basement. The dining spaces are mostly tucked in intimate nooks, utilizing the freshest local ingredients. Don’t pass over the vegan menu options either. 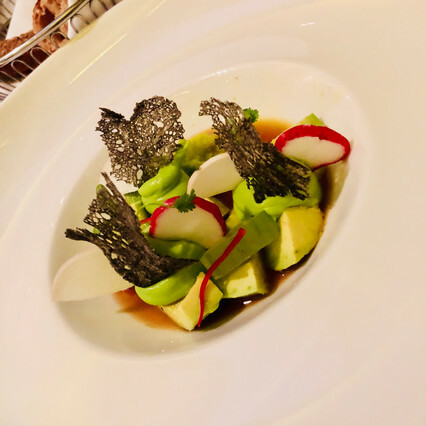 The avocado ponzu was nothing short of devine and the signature pigeon dish melted in your mouth. Might want to take up the hotel on babysitting services unless you get an early table in a nook. Book this Michelin noted spot far in advance. 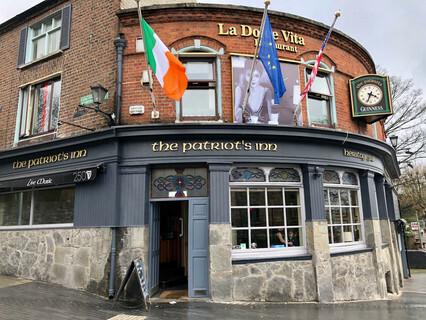 The Patriot’s Inn is just across from the 1796 jail- Kilmainham Gaol and the Irish Museum of Modern Art. Both which offer cafes but we decided to try this pub. Traditional food with sub standard service. But it felt cozy and authentic and the Guiness was cold, so there’s that. I cried when we said goodbye to Tom Young at the airport. No one wanted to leave. We are already planning a fall return visit! Do make sure your passport is up to date. $ – they use Euros so either exchange before- (PNC bank can take up to a week FYI) or just take money out at an ATM upon arrival. Many credit cards charge a overseas transaction fee and AMEX is not widely accepted. If you’re a reader try Princes of Ireland. Not a reader- Netflix has Castles of Ireland which gives you a history tour while taking you through castles. Ariel Ireland show also great! Other kids recommendations below. For a little fun do your 23 and me DNA ancestry and see if you are Irish. We are! Also- FYI Crack means fun. So don’t fret when you hear someone saying they had a bit of crack last night! Plan your days and BUY TICKETS AHEAD for Dublin attractions. If renting a car, do it ahead of time and request automatic – they drive on the other side so shifting with your left hand on some skinny roads is not a time for learning new things. Layering is the key to being happy all day! Little bottle of laundry detergent to wash items. Ours dried quickly overnight on the towel warmers. One way of packing lighter is by utilizing the hotel laundry services. If bringing a stroller make sure it’s a sturdy one (a BOB or MountainBuggy would be great) and find your rain cover you may need it. Day bag/carry on – i like this tumi backpack because it works for hiking or a day in town. Must have water bottle holders and slip onto rolling luggage! Activities for travel – see the ones below. Historopedia was great for the plane and AerLingus had nice movie choices. 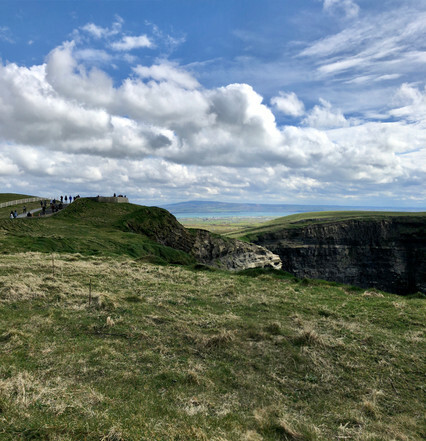 Enjoy Ireland before, during or after your visit – or if you need to bring Ireland to you. Historopedia of Ireland is a fun busy book for the kids. Print this map or similar. Can they find the city that would be closest to home?